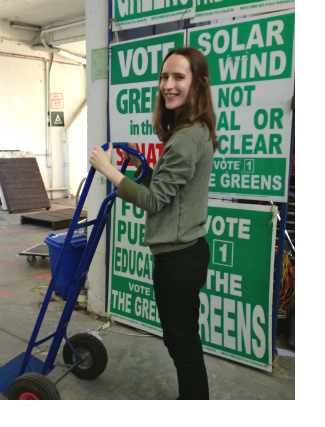 Have you ever wondered what it's really like to volunteer for the Greens? From door-knocking on the campaign trail to handing out how-to-vote cards on election day and everything in between, Greens volunteers play an invaluable role in keep the wheels of the party turning. That's because the Greens are the only party that's truly powered from the bottom-up. We asked a couple of our volunteers to share their insights as Greens volunteers – from what motivated them to lend a hand to the impact volunteering has had on them. My name's Eleanor and I've been volunteering with the Greens for several years. I’ve been voting Green ever since I was old enough to enrol, as they are the party that stands up for things that are important to me, like social justice and the environment. I decided to get involved in early 2011 and one of the things I did was hand out how-to-vote cards at a polling booth for the NSW state election. It was a really great experience, coming face to face with voters and meeting so many people who were also supporters. Because I was new I was working with more experienced volunteers who taught me how to get the Greens’ message across. They let me know that getting a flyer into a voter’s hand on election day is one of the most important things you can do in a campaign – it’s shown to make a big difference with swinging voters – so I’ve signed up to hand out at every election since. I’ve been doing lots of other activities as a volunteer, too – from policy research to database entry to helping out in the big warehouse in Erskineville. It’s been a great way to meet like-minded people and all the Greens I’ve come across have been smart, fun and passionate about making change in the world. It’s also given me the chance to learn a lot more about all the issues that the Greens stand for. A lot of people think the Greens have no policies other than saving the environment but I’ve discovered policies on issues from job creation to education to public investment in research and development. These are all things that are important to me. At the start of the 2013 election campaign I heard Christine Milne talk about the Greens’ commitment to get all Australians out of poverty, to help single mothers, to increase youth allowance, and to make sure that the economy serves society – not the other way around. She spoke about the kind of Australia that I want to live in and be part of. That’s why I’m volunteering for the Greens: to do what I can to make sure that’s the Australia of our future. My name's Ian and I've been volunteering with the Green for the past few elections. My very first volunteer experience was as ‘booth captain’ on election day. That involved getting up very early to get the polling booth in Paddington to hang up our candidate’s posters, competing for the best spots with the other parties. 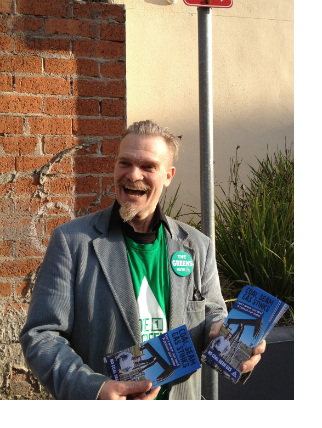 I also coordinated a group of volunteers across the day who were handing out the Greens’ how-to-vote cards. Working on election day is still one of my favourite things to do. You know when you've convinced an 'undecided' voter because they tell you 'I voted for you' on their way out or give you a smile. It's very satisfying, as that sort of experience is scattered throughout the day and you know that you’ve made a real difference for the Green vote. I’ve done a lot of other things as a Greens volunteer, too. I’ve made stencils, updated the website, packed boxes of flyers to be taken out to stalls and bundled corflute posters ready to be hung up on telegraph poles. Often when I go to rallies I take a clipboard along and sign up other people to be Greens volunteers on election day, too. I find that there are a lot of people who are activists on different campaigns who are happy to spend a few hours helping out the Greens at polling booths. I’m doing everything I can to stop a further shift to the right in Australian politics. I’ve found that the best way to convince people that the Greens are a great alternative is through one-on-one conversations. Every taxi ride I take is an opportunity to talk about Greens policies, to explain how they are fully costed by the Australian Treasury Department (unlike the major parties), and that they are sound as well as being compassionate. Outside the Greens I am involved with several other community and activist groups, too, where I’m learning new skills all the time. It is always so satisfying when you're given the opportunity to increase awareness and the public responds with enthusiasm. I like that the Greens are inclusive and bring together a range of voices and opinions, all working together to create a better future for Australia. The Greens always welcome new volunteers who want to join the team and experience the campaign first-hand. All skill levels are welcome!